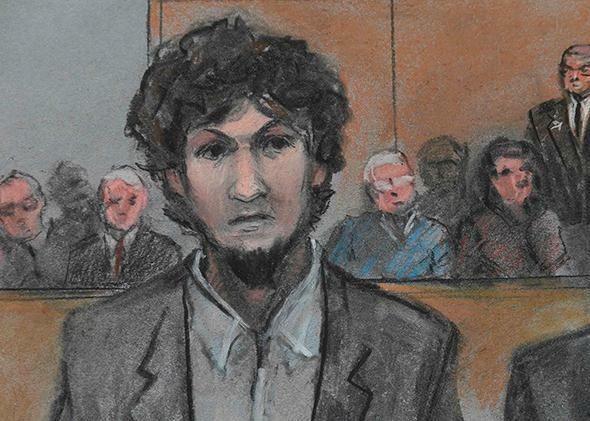 Boston Marathon bomber Dzhokhar Tsarnaev is shown in a courtroom sketch after he is sentenced at the federal courthouse in Boston, Massachusetts May 15, 2015. The formal sentencing hearing for Boston Marathon bomber Dzhokhar Tsarnaev on Wednesday promised to be high on emotion—with impact statements from victims and survivors—but short on drama. The jury had already sentenced Tsarnaev to death on six of the 30 counts on May 15. But then Tsarnaev himself spoke. He did not testify during his trial and he had not spoken publicly since he was arrested after a four-day manhunt that left him hiding in a boat. He’d spent much of the trial slouched and looking down, and rarely appeared remorseful. On Wednesday he apologized in a brief statement. “I am a Muslim. My religion is Islam. I pray to Allah to show his mercy to the deceased in this bombing,” he said. Tsarnaev’s brief statement followed emotional statements from survivors. The court heard from Bill Richard (the father of 8-year-old victim Martin Richard), Patricia Campell (mother of victim Krystle Campbell), Jennifer Rogers (the sister of slain MIT police officer Sean Collier), and many survivors. The case will now likely move to the appeals process. It is extremely rare for the federal death penalty to be carried out. The most recent federal executions were those of Oklahoma City bomber Timothy McVeigh and drug trafficker and convicted murder Juan Raul Garza, both in 2001.